Gatlinburg Skiing- Perhaps what Ober Gatlinburg Ski Resort is best known for, speed down the 9 different trails offered at this mountain resort. From the beginners slope of Cub Way to the challenging Grizzly trail, Ober Gatlinburg offers a trail for every skill level and even boasts a Ski School for visitors who need to learn a thing or two about the sport. Don't worry about falling on the slopes - Ober Gatlinburg's Ski Patrol will be there to help you in case of an accident or emergency. Gatlinburg Snowboarding- Ober Gatlinburg offers features that every snowboarder is bound to love. From Terrain Park, where boarders can enjoy executing trick maneuvers on their boards or sliding down the 9 slopes with ease. Gatlinburg Tubing- Enjoy Ober Gatlinburg's exhilarating tubing experience where you can race down a special section of the resort for some winter family fun. Gatlinburg Ice Skating- Though open all year, families might find a session at the only Gatlinburg ice skating rink is the perfect winter activity at Ober Gatlinburg Ski Resort for them. Alpine Slide- Enjoy speeding down the mountainside on your sled down the 1,800 foot concrete slide at Ober Gatlinburg. Wildlife Encounter- See the natural wildlife of the Smokies, including bears, river otters, and birds of prey, at Ober Gatlinburg Resort's wildlife exhibits. Amaze'n Maze- Get lost in the this maze attraction. Chair Swing- A carnival favorite. 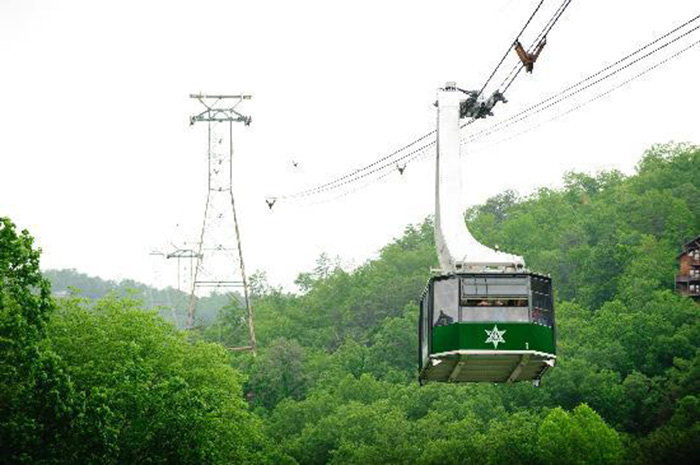 Spin through the air on this fun Ober Gatlinburg ride. Blue Cyclone Rapids- Enjoy 600 feet of water filled excitement on this Ober Gatlinburg water ride. Mini-Golf- Play a round of mini-golf at Ober Gatlinburg Ski Resort for a fraction of the cost you would pay elsewhere. Arcade- Earn tickets to redeem for prizes at Ober Gatlinburg's very own arcade. Aside from Gatlinburg skiing and Ober Gatlinburg's fun summertime activities, the resort features onsite gift shops and restaurants to feed hungry bellies after a day in the park. The Gatlinburg ice skating rink is open year-round for family fun on the ice, while the Aerial Tram provides scenic views no matter what the season. Find Lodgings Next to Ober Gatlinburg Ski Resort & Amusement Park! A stay in one of Cabins USA's Smoky Mountain Village cabin rentals places you right next to all the fun and excitement of Ober Gatlinburg Ski Resort. After a day filled with Gatlinburg skiing, return to your cabin where amenities such as king-size beds, hot tubs, jacuzzi tubs, game rooms, theater rooms, and more wait for your enjoyment and relaxation.